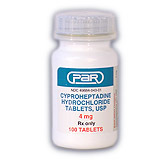 Cyproheptadine is an antihistamine that is commonly used in pets. It is used in the treatment of many symptoms including allergies, loss of appetite, and increased serotonin production associated with Cushings disease. It does not treat the underlying problems causing these symptoms. Cyproheptadine is an antihistamine that is commonly used in pets. It is used in the treatment of many symptoms including allergies, loss of appetite, and increased serotonin production associated with Cushings disease. It does not treat the underlying problems causing these symptoms. Along with its antihistamine effects, Cyproheptadine also works as an anti-serotonin agent. Serotonin is a neurotransmitter in the brain, and when it is suppressed, it leads to an increase in appetite. This is especially useful in cats undergoing chemotherapy, as they tend to lose their appetite. Diseases such as Cushings lead to an increase in serotonin, so cyproheptadine may be used to reduce serotonin levels.